April | 2015 | Planet Pedro! Posted on 04/30/2015 by planetpedro CommentsNo Comments on Message to Ed Miliband before he comes to Glasgow. Message to Ed Miliband before he comes to Glasgow. Last time I sent you a message it was before the election was called, when you spoke at Scottish Labour’s conference. At that time I asked you to do two things. One was to rule out any chance of a deal of any kind with the SNP. You did not do so then, but have done since, so thanks for that. Every seat you win in Scotland will first make, then add to a working majority. Your prize will be to serve as Prime Minister for five years. If you fail, you will not be Prime Minster and will always be remembered for your election as Labour leader ahead of your brother. Over to you. Prove your critics wrong. Make it your greatest speech and your greatest hour. You need it as much as we do, and as much as Scotland and the rest of the UK does. In that, I was probably wrong: the time for your finest speech and finest hour is now. You will be aware that much of history occurs by accident, or rather is a consequence of a series of events rather than of a pre-planned strategy. Tolstoy goes so far as to suggest that this was how Napoleon’s ill-fated Russian campaign came about; in our own history, we can look to the origins of the two World Wars, and between them to the establishment of Irish independence. In the view of many in Scotland, we are now in danger of a similar position. The SNP has of course always had an agenda based on independence, which it has pursued ruthlessly and with great political skill. However, its opportunities to do so have been created by a number of fortuitous (for the SNP) events. The largest of these include the foolishness of the Major government in abolishing the Scottish regional councils; the misapprehension of Labour that a devolved government would blunt nationalism; Labour’s choice of weak and compliant candidates for 1999 election; the premature deaths of John Smith, Donald Dewar and Robin Cook; and the ghastly mess that the Bush White House made of the Iraq War. The smaller events (which also contribute) stretch right down to SNP supporters winning the Euromillions lottery, and Labour not adopting any strategy to secure the second list votes in Holyrood elections. In the latter case, if Labour voters constituency MSP voters had voted for the party on the Regional Lists at the same rate as the SNP’s did, we would have won the 2007 election and/or denied the SNP an overall majority in 2011. (By the way, we can see how it is done in this advert from the CDU: https://www.youtube.com/watch?v=_JBu7f9TWSY) In either case, there would have been no referendum. Finally, we have had the mistakes of the Cameron Tory government, which conceded a referendum on the most perfunctory of terms: only supported by under one-quarter the electorate, conceded on the SNP’s timetable and terms, and on the SNP’s question. As a result we have an SNP Scottish Government which has been able to create a fantasy political world, where austerity is stopped by proposed Full Fiscal Autonomy – which would entail upwards of £7.6 billion extra cuts; and where the SNP’s failure in office on vital services such health and education are not taken into account. In 2011, in parts of Scotland, the SNP broke the D’Honte system in the Holyrood election; you do not need to be told that this is a world where the SNP is threatening to break First Past The Post. It is a world where very poor quality candidates threaten some of the most able and hardworking Labour MPs in the UK. It is a world where their SNP replacements will have not the interests of their constituents at heart, but their pursuit of the dogma of independence at all costs. So what we can we ask you to do? Now is the time that speech of your life, when you come to Glasgow just a few days before polling day. What you might say is this. Labour is a social democratic party. We are not nationalist and never will be. That is the reason that we pursue policies that are based on co-operative and collective action, as our movement has always done: in local councils, in trade unions and through the co-operative movement. Labour believes that unions at every level are the key to personal and social wellbeing: in our families, in our local communities, in our workplaces and between our nations and regions, as United Kingdom and in the EU and beyond in the wider world community. And as we have said in this election campaign, for this reason, based on those values, we believe that Britain and Scotland only succeed when working people succeed. In other words, when families are struggling to make ends meet due to low pay or people cannot plan their lives because of exploitative zero-hours contracts, we need to take action on their behalf. We need to use the power and authority lent to us by our fellow citizens as their representatives to take action on their behalf to put a stop to it. Occasionally, however, we take a step back: when some issues, such as those of national sovereignty are at stake, he demit that power, and we have a referendum, as was the case in Scotland a few months ago. These are rare occasions in a representative parliamentary democracy such as ours, and therefore should not be trifled with. I am proud of the role that Scottish Labour played in keeping the United Kingdom united, and maintaining the strength that comes from unity. I am proud of Gordon Brown and his inspirational late interventions. I am proud of Jim Murphy on his Irn Bru crate, and Margaret Curran and Johann Lamont and all of our Labour members who stood strong against sometimes intolerable abuse from the enemies of unity. The outcome of that referendum was a firm and clear NO vote; we all know that, and we all accept it – except, it seems the SNP. This in spite of the many promises made by the then First Minister and his successor, that it was a once in a lifetime or once in a generation event. Friends, I am saying now and here, tonight to Scotland and the rest of the UK: if I am Prime Minister, I will refuse to have anything whatsoever to do with those who would so disrespect the sovereign will of the Scottish people. That will was exercised and expressed in the referendum: Scotland decided to remain part of the United Kingdom. So there will be no deal with the SNP, not at the beginning of the next Parliament, nor the middle not the end. They can vote anyway they like, but after all, they going to look pretty daft if they vote against Labour. And I will go further. I will say to all of those people who voted NO and to clear the majority of Scots who rejected the independence proposal – that Labour will not forget you, we will not let you down. And I am saying two things to Nicola Sturgeon tonight. First, I am saying that you are currently fooling no-one when you say that you are not planning a further referendum to try to overturn the democratic verdict of the Scottish people. I am challenging you, at the earliest opportunity, to tell the voters of Scotland the truth. Tell them that you want a further referendum and come clean that you want it as soon as possible. Show them how little you care for the democratic choice they have made. Secondly, I am saying that when you do finally admit to Scotland’s worst kept secret, you will not get the referendum you want, as no Labour government of which I am part will agree to it. The SNP and all other parties have agreed that the way forward is through the Smith Commission recommendations and the new Scotland Act which we will pass in the first 100 days of a Labour government. Because you see, friends, our responses mark out the differences between Labour and the SNP. We respect the votes of the Scottish people – to the SNP those same votes are at best means to their end of independence, and as in the case of the referendum, they see your votes as an obstacle to that aim. Our policies and our aims for Scotland and the UK are based on our collective values: whereas those of the SNP are moulded to fit their central aim. Take for example the SNP’s economic policy of Full Fiscal Autonomy. It would cost Scots upward of £7.6 billion in cuts or higher taxes of both, and has been shot down by economists and independent commentators, but Nicola Sturgeon and Alex Salmond still insist that their proposal makes sense and that all of the experts have it wrong. And this shows the potential danger ahead for Scotland if the progress of the SNP is not halted. Its politics will be increasingly dominated by a party that will deny the view of any expert, will swear day is night and black is white…as long as it suits their purpose, which is independence. Friends, comrades, I am committed to halting that progress. And I stand here tonight with you to say “This far and no further. They shall not pass.” Scots will get what they voted for. So I will stand up to Nicola Sturgeon and to Alex Salmond too, for you and with you. Finally, let us remember two further things about this most crucial of elections. The first is that that when Gordon made his fantastic referendum speech at the Maryhill Community Central Halls last year, he spoke of the silent majority. The same is true today. I can see the opinion polls with their disheartening headline figures, especially in the light of the tireless efforts of Jim Murphy and countless others. But when you look at the data tables, there is up to a third of voters still undecided. Let us go out to those voters and convince them to vote Labour. The second is that the silent majority last September found its loudest voice in the polling booth and in the ballot box. And hard as Gordon, Jim, Margret and Johann fought, the greatest winner at the referendum was the power of the secret ballot. I call on all Scottish voters who do not want a rerun of the destructive and divisive referendum to take just a short moment before casting their vote. And if you know that it is only Labour that can stop the SNP in constituency, well, welcome aboard, the greater the defeat we can inflict, the better. So those are some ideas Ed. No doubt you have many of your own, but I would suggest that the situation for Scotland and for so many good comrades is so perilous, that you should major on the threat of the SNP in your speech. The SNP thinks that the way in which accidents are falling in their direction means that it is their destiny to achieve independence. But history also shows that a good speech or bad one can affect the flow of fortune, either for the better or for the worse. If you want the negative example, you can think of Neil Kinnock at Sheffield in 1992. If you want the positive side, you can see plenty of great examples: ironically, Neil again, facing down the Militant Tendency, or, again Gordon Brown in Maryhill. You have another chance to make history. AS he lives in Southall, Middlesex, Michael Rossi (Letters, April 29) may be excused in his misapprehension that SNP politicians are somehow self-denying ascetics who reject the luxury of office – he has presumably missed that Nicola Sturgeon is the UK’s highest-paid politician, having awarded herself a higher salary than that of David Cameron. However, his point that ministerial responsibility is a distraction from the “real job” of MPs does take us to the heart of the choice before Scottish voters. Ms Sturgeon has made it clear that her party will under no circumstances put the Tories in power; and at the same time Ed Miliband has promised that he will make no deal with the SNP. This means that the SNP will be an irrelevance in the coming parliament, albeit no doubt a noisy one. In contrast, the whole point of the Labour Party is to represent working people and the disadvantaged in society and to do so whenever possible in positions of power and influence. Classically, the Scottish manifestation of this debate has been in terms of the Two Johns: Maclean and Wheatley. Which would you rather have, Maclean the undoubted firebrand, imprisoned for his politics, first Soviet consul to the UK, but who achieved absolutely nothing, or Wheatley, who invented council housing and transformed the lives and health of literally millions of people in a legacy which endures today? A further example comes to mind from earlier SNP surge: in the 1970s, some voters may have been tempted to vote for that party over Bruce Millan. However, Millan went on to be Secretary of State and in that position literally invented urban regeneration in Glasgow when he cancelled the New Town programme and committed the same expenditure to the Glasgow Eastern Area Renewal (Gear) project. He then became a Labour-nominated European Commissioner and worked with Strathclyde Regional Council to create the regional development programmes which brought many millions of pounds of investment in infrastructure and training to the people of Glasgow and beyond. The same choice faces many Scots today, most pointedly in the east of Glasgow, where the choice of the voters is whether they wish to have their voice heard at the Cabinet table through Margaret Curran or to have it confined to a nobody on the opposition backbenches? That is the choice: do voters want the SNP, in which case their MPs will be ultimately no more than noisy self-publicists who will inevitably prove to be the proverbial empty vessels, or Labour whose men and women seek office to work hard in government to get things done, pragmatically and practically, with all of the difficulties and compromises which that entails? Posted on 04/26/2015 by planetpedro CommentsNo Comments on Sudden Fame! At Aye Write Festival. Sudden Fame! At Aye Write Festival. 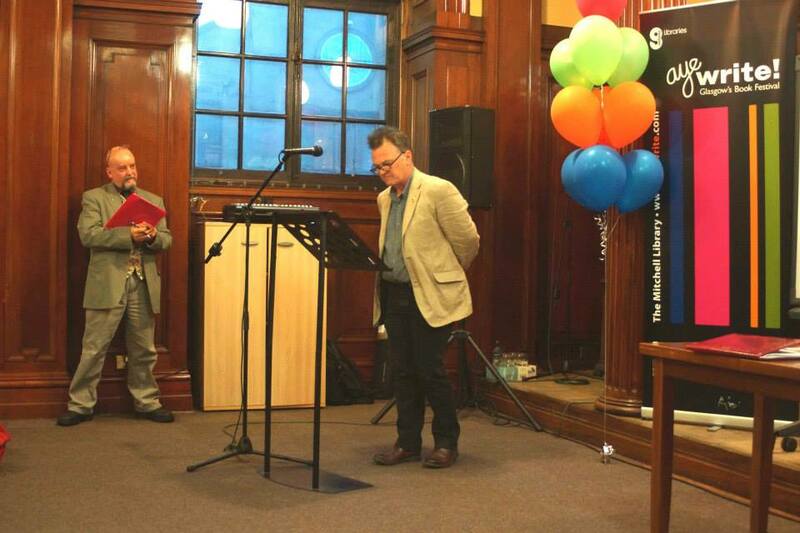 Here’s me reading at Federation of Writers (Scotland) event. What Harold said applies to the SNP as well as the Tories. IN setting out the steps required for a further referendum, I am afraid your correspondent Alan Carroll (Letters, April 22) has missed out the most important part. I am happy to fill the gap. Like the one that was held in September last year, any further referendum would again require the consent of Westminster, as the constitution is a matter reserved to Scotland’s UK government. All of the parties of government have committed to implement the Smith Report, so none would have a mandate to sanction such a referendum. Likewise, Nicola Sturgeon has told us that the General Election is not about independence, so not even her MPs would have any mandate to support a new referendum. In addition, it was specifically pledged by Alex Salmond and Nicola Sturgeon that there would not be a further referendum for a generation or a lifetime. So all in all, there is no chance of a new referendum at any time in the foreseeable future, which is as it should be, and anyone voting for the SNP in the hope that it would bring one (and independence) any closer is wasting their vote. Ian Bell draws our attention to the rather odd intervention of Sir John Major in the General Election campaign. In doing so, he might have pointed out that amongst other follies (like rail privatisation) Sir John was responsible for the loss of all of his party’s Scottish seats, and that he was to blame for the abolition of Scotland’s regional councils, which marked a very serious crossroads in Scottish political history. These are the fault lines which still endure between Scottish Labour and the SNP (as set out by Alex Gallagher) – Labour believing that politics is about co-operation for the common good in terms of the economy and public services, and the SNP believing in independence no matter what the risk or cost. Anyway, thanks for everything, Sir John. You never did know anything about Scotland. Posted on 04/19/2015 by planetpedro Comments2 Comments on It’s A Wonderful Labour Life. It’s A Wonderful Labour Life. These days as a Scottish Labour Party member you could sometimes feel like ending it all. So on a dark night recently I found myself looking down at the Clyde, when a stranger appeared next to me. “Well” replied Clarence “I had intended to take you on a tour of Glasgow to show you what it would have been like without Labour, but time’s short: there are lots of people like you to get round. It’s understandable, with those appalling opinion polls. “Imagine the UK, Scotland and Glasgow without the NHS. “Without laws against discrimination on grounds of race, gender and sexual orientation. “Without abortion rights for women. “Imagine the UK, Scotland and Glasgow without the National Minimum Wage. “Without the right to be a member of a trade union. “Without the New Deal, which put 1.8 million people back to work, paid for by a windfall tax on privatised utilities. “Without all of the measures which raised a million children out of poverty. “Without minimum incomes for pensioners and families. “And what about Iraq? And Trident? “But imagine Sierra Leone with thousands more deaths and amputations. “And imagine Kosovo after a Serbian genocide. “Imagine Afghanistan still run by the Taliban and used a launch pad for terrorism. And millions of Afghani women and girls living as slaves. “ And you will remember 1983, when unilateral nuclear disarmament was in our manifesto, and on the doorstep we were told ‘if others have got nukes, we should keep them too.’ Do you think that people feel safer now than they did then? “And imagine a Scotland and a Glasgow without Labour. “Without any of the UK-wide benefits I have already reminded you of. “Without the Holyrood Scottish Parliament. “Without the £1 billion write-off of housing debt, allowing transformation of housing stock in Glasgow and elsewhere. “Without the abolition of university tuition fees . “Without a smoking ban ahead of the rest of the UK. “Without nationalisation of the Royal Jubilee Hospital to provide the finest heart service in the UK, if not Europe. “Without free bus travel for the over-60s. I turned to Clarence to answer that he was of course right, and that Labour had created all that was best in the UK and Scotland, but he had vanished as mysteriously as he had arrived. I wondered a bit about Clarence: not much of a Labour name, on first hearing. But neither is Clem, or even Anthony Wedgwood-Benn. And that may be another part of the whole point: Labour is the party for all classes and backgrounds. It is also the party of the UK and of Scotland. The differences between us do not matter for a party which fights for a better society as a whole – and a better country as a whole. But there was no time to be lost, and I started back to the Labour Campaign HQ. When I got there, the place was full and vibrant, with plenty to be done. And some joker had painted a red star on its front door. Posted on 04/18/2015 by planetpedro Comments1 Comment on My latest on Scotland In Union: Why Artists Should Choose Freedom Over Independence. My latest on Scotland In Union: Why Artists Should Choose Freedom Over Independence. I am really looking forward to the Edinburgh Festival this year, which will of course be dominated by the aftermath of the independence referendum. The show which will cause most ripples will of course be the scathing farce called “le Mabida Imaginaire”, based roughly on Beaumarchais via Molière and a nod to Mozart. Act 1 is taken from Le Bourgeois Gentilhomme, in which a ludicrous individual called Salmond pumps himself up with outlandish pride; in this he is joined by diverse comic characters such as his sycophantic manservant Lickspittle Wishnot and his airheaded but shrewish sister, Pepsicola Dudgeon. Act 2 is in the same vein, but resumes after Salmond has failed in his political goals, and relates more closely to Don Juan. Goaded on by his sinister friend, Stewart Sneermeister, and far from accepting defeat gracefully, Salmond takes his folly to still more ridiculous levels as he declares himself to be like Nelson Mandela, and dons blackface accordingly. The resolution comes about when he looks in a mirror, and his reflection speaks in Comandatore terms as the real Mandela, and tells him not to be a fool. Salmond sees the light, and accepts a place in the new UK Senate of Nations and Regions (formerly the House of Lords). Of course, this production will never really happen. Nor will a radical production of Brecht’s Caucasian Chalk Circle, in which the debate over the future of a territory is decided by what is best economically rather than what is sentimentally longed for. And neither will Scotland’s Makar Liz Lochhead write poems which attempt to bring the country’s people together behind the outcome of their will to stay part of the UK. Nor will any of Scotland’s classical, rock, pop or folk composers and artists come forward with a symphony or suite or album which praises those who delivered a No vote. Or even an opera buffa based on the above libretto. The fact is that Scotland’s creative and cultural sectors are now choosing to put themselves in the pocket of the SNP and the Scottish Government. The question is why this should be the case, and especially as much of the sector benefited so much from the unionist politics it so despises. One of the great joys of life in, for example, Glasgow has been its arts facilities and programmes, which have received generous funding from the Labour City Council. Indeed, the left-wing nature of many community arts and events such as MayDaze (and earlier Mayfest) has in the past been of the one-working- class-one-struggle kind. Its main targets were the Tory governments of the day. But it seems that the radical counterculture is now in the pocket of the establishment. (A notable exception must be made of the late David MacLennan, who was prepared to make the case for unity but sadly died of MND three months before the referendum.) There may be two reasons for this. First, the continuing illusion – for example amongst my fellow open mic poets –that the SNP is not the establishment, when nothing could be further from the truth. They have been in government now for eight years, half of that time courtesy of support from the Annabel Goldie and her Tories. They occupy seats in every legislature and every council. They have sycophantic mouthpieces in the Scottish media. The First Minster is a career politician who has wanted no other career since she was a teenager, her predecessor has a House of Commons pension as well as fat Holyrood salary. Secondly, it is the case that the SNP has built an artistic and cultural client state which is now used to fawning to its whims. I witnessed an insight into this at last year’s Edinburgh Jazz Festival. Between the sets of the charming and remarkable American boogie-woogie pianist Stephanie Trick, we had to put up with a dreary singer-songwriter. She also volunteered that she and friends from her village had been paid a government grant to spend a week at a highland castle to write music. Which is all very well until one considers that Scotland in 2014 (and 2015) had and has foodbanks and people in real need. In which case, sorry, but weeks away for musicians to do what they could at home seems a bit of a luxury. So were they writing pro-SNP songs? Who knows, but it is pretty certain that they would not writing anti-government songs. After all, we know that the Government’s grant-giving process is absolutely capricious, from the story of the Scottish Youth Theatre. Having delegated responsibility for grants to Creative Scotland, the then First Minister Alex Salmond intervened directly to overturn its decision on the funding of the Scottish Youth Theatre, to the tune of £1 million. Every arts company in Scotland now knows about that, and will be aware that the reverse also applies: what the SNP Scottish Government giveth, the First Minister can take away. In fact, there is known to be at least one major figure in the arts who constrains their political comments on the grounds that not only their own funding might be affected, but also that of others involved in joint projects. In this compromised situation, how can artists proceed – damned if they do, servile if they don’t? The answer as in all dilemmas is to Do The Right Thing and be damned for it, rather than living to regret doing the wrong thing through cowardice. One of the real pleasures I have had recently is to hear poet Tom Leonard read, for two reasons. Nor should it be. If poets and artists are to fulfil the role Shelley set out for them as “the unacknowledged legislators of the world” they should be offering critiques and alternatives to the government and the established politics of the day, which in Scotland is the SNP and its narrow mean-minded vision and paltry achievement. It is hard to believe that all writers and artists in Scotland are likewise so selfish and narcissistic as to put their own interest above that of the general well-being of the people of Scotland. But the dissenting voices are few and far between, and risk the wrath of the Scottish Government’s culture client-state. This is in fact is all the more reason for them to speak up sooner rather than later. Let’s have some anti-SNP diatribes, let’s have the le Mabida Imaginaire. Let’s have Sturgeon’s Scotland. Let’s have a real dissident arts scene in Scotland which rejects the Chekovian self-delusion of the Scottish Government . Artists have nothing to lose but their establishment chains, by choosing freedom over independence on the SNP’s terms – which is not independence at all.